Aji dulce peppers (Capsicum chinense) hail from Puerto Rico, where they are an important part of local cuisine. 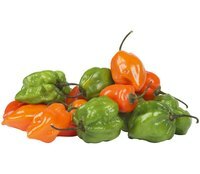 These habanero cousins grow in the same caplike shape and feature the same smoky flavor as their spicy cousins, but qualify as sweet peppers with their lack of fire. They ripen light green but turn red and orange with age. Aji dulce peppers need warm summers, rich soil and adequate moisture. Growing them in pots keeps them mobile and in the house for protection. Use 12-inch diameter pots with drainage holes for pepper plants, which need adequate room for their foliage and root systems. Ideal pots measure at least 6 inches deep for drainage and root growth. Mix a rich, loose potting soil with 1 part commercial potting soil to 1 part each peat moss, organic compost and perlite. Peppers cannot grow or bear healthy fruit in poor or thick soil. Add slow-release 5-10-10 or 8-16-16 fertilizer for long-term nutrition. Plant Aji dulce pepper seeds 1/2 inch deep, with one seed per 12-inch pot. Water the soil with 2 inches of water. Using a watering avoids displacing the pepper seeds in the soil. Water the peppers with 2 inches of water every week to maintain soil moisture. Give them 12-12-12 fertilizer when the first fruit sets. Keep fertilizer off the foliage, as it will burn it. Harvest the peppers at their maturity date. Cut young green peppers for milder flavor or leave the peppers on the plant to ripen to red and orange for stronger taste. Use scissors for clipping the peppers from the plant. Pulling the peppers may damage the plant. Aji dulce peppers require at least 90 days of growing to produce their fruit. Nitrogen fertilizer early in the season encourages foliage growth but damages fruit set and growth. Lack of water or nutrition causes pepper plants to produce small, extremely hot peppers. Do Green Peppers Turn Red on the Vine?